NOTE: The CDC has identified Bolivia as an affected area of the Zika outbreak. Pregnant women are advised to be cautious as the virus can lead to birth defects. Adults affected by the virus experience fever, rash, joint pain, and conjunctivitis (red eyes) typically lasting a week. You can learn more by visiting the official CDC website. Bolivia is a beautiful, geographically diverse, multiethnic, and democratic country in the heart of South America. It is surrounded by Brazil to the northeast, Peru to the northwest, Chile to the southwest, Argentina and Paraguay to the south. It shares with Peru control of Lake Titicaca (Lago Titicaca), the world's highest navigable lake (elevation 3,805m). Tupiza Capital of Sud Chichas Province, it is known for it's beautiful red rock formations, mild climate, and many tourists attractions. Visitors from countries from Group 2 can obtain a visa on arrival for a fee of around USD100. This fee is estimated in UFV (UNIDAD DE FOMENTO DE VIVIENDA) and it costs 300 UFVs (according to INSTRUCTIVO ITA/ESFP/DGFM No. 0097/2015). Banco Central de Bolivia calcultates UFVs to Bs rate every day. Holders of Indian passports can obtain a visa on arrival or advanced at any Bolivian Embassy or Consulate - the visa will not take more than 24h to be issued and most times are issued on the spot, as long as the applicant presents the following documents: passport, photos, itinerary of travels in Bolivia, photocopy of credit cards and hotel reservations. And Indians also walk away with no visa fees (gratis visa). Arriving overland from Peru, US citizen tourist visas can be obtained at the border. Officially, they require a visa application form, a copy of the passport, a copy of yellow fever vaccination (no longer needed in spring 2016), a copy of an itinerary showing departure from Bolivia, evidence of economic solvency (usually credit card suffices, or a printed statement, but they rarely ask for this), a hotel reservation or written invitation, and a 4cm X 4cm or "passport sized" photo (they sometimes take photos there so the photos may not be required). A USD160 fee (as of August 2015) is also required, payable in freshly minted cash. Any old or marked bills will not be accepted. There are photocopy machines at border crossings. They also may ask for a second copy of the passport in order to get the entrance stamp. Allow at least 30-45 minutes to get through from exiting plane to getting baggage. Another 20-30 after getting baggage to leave the airport. Arriving overland from Chile on 4WD tours from San Pedro de Atacama to Uyuni in Bolivia, US citizens can obtain a visa at the Hito Cajon border crossing. As of April 2017, a tourist visa can be obtained at Hito Cajon with a valid passport, one copy of passport, yellow fever vaccination proof, two passport sized color photographs of the applicant, and $160 in good-condition US dollars. The copy of the passport and the photographs will be taken by Bolivian immigration control. Following on from Aerosur's demise in September 2012, the best options from Europe to Bolivia are now with Air Europa or Boliviana de Aviacion from Madrid to Santa Cruz. Other connections can be made in neighbouring countries such as Brazil or Peru, or in the US. The cost could go from €1000-1200 to other higher prices depending on the class and duration. Keep in mind that only about 5% of all the roads in Bolivia are paved. However, most major routes between big cities such as Santa Cruz, La Paz, Cochabamba and Sucre are paved. A 4x4 is particularly required when off the flatter altiplano. Be aware that in mountainous regions traffic sometimes switches sides of the road. This is to ensure the driver has a better view of the dangerous drops. Transportation strikes (bloqueos) are a common occurrence in Bolivia, so try to keep tuned to local news. Strikes often affect local taxis as well as long-distance buses; airlines are generally unaffected. Do not try to go around or through blockades (usually of stones, burning tires, or lumber). Strikers may throw rocks at your vehicle if you try to pass the blockade. Violence has sometimes been reported. Many strikes only last a day or two. There is a government website with a live map showing which roads are closed or affected by landslides. Buses in Bolivia are a nice cheap way to get to see the beautiful scenery while travelling to your destination. Unfortunately the buses often travel solely at night. There are different types of buses: "bed bus" with fully reclining seats and leg platform (bus cama), "semi-bed bus" (semi cama), normal. Keep in mind that roads are occasionally blocked due to protests, often for several days. So ask several companies at the terminal if you hear about blockades, unless you are willing to spend a few days sleeping on the bus. Bus travel is usually pretty cheap. Estimate that it will cost you about USD1 for every hour of travel (it's easier to find travel times online than actual price quotes). Prices do change based on supply and demand. Sometimes you can get a deal by waiting until the last minute to buy. Hawkers are constantly crying out destinations in the bigger bus stations cajoling potential riders to take their bus line. There is a negligible tax for using bus terminals, you pay it as you leave. Usually you have to "check-in" your big bags for the travel - they get a tag and get to the baggage compartment and you get a copy of tag. Overhead reading lamps and air conditioners on buses rarely work (if at all). There usually technically is a WC on board, but it's never open. Rather the bus stops in some predefined "stations" for WC (baño) and eating. On longer journeys they'll start some movie on TV in the bus - most are brutal ones. Sometimes (usually when leaving) people gather around or enter the bus to sell food (cuñape, salteña, pollo) to the travellers. At times "brainwashers" enter the bus to sell some books (i.e. health-related) - they tell (using their "plastic" voice) people different things to persuade them to buy their stuff. Bolivia has 37 official languages -of which Spanish (often called Castellano), Quechua, and Aymara are the main ones. In rural areas, many people do not speak Spanish. Nevertheless, you should be able to get by with some basic Castellano. Bolivia is one of the best places in which to learn or practice your Spanish because of their very clean, deliberate accent. There are many options for studying Spanish in Bolivia, and they are usually very good (often, the program includes a very good homestay component). The Death Road (North Yungas Road including the old section): from La Cumbre to Coroico. A mountainbike tour of 64km where you'll be able to see the diversity of Bolivia. Leave from La Cumbre at 5000mts, in a cold and windy environment, and get to Coroico, in a wet and tropical environment. You can take an organized tour with one of the companies (i.e. Downhill Madness) from La Paz or ride it on your own bike. If you ride on your own, be very careful (ride down in-line one after another, keep safe distance from the rider in front of you, slow down before the turns), use a good mountain bike (at least with front shock absorber), helmet. If you take the tour, you'll get the equipment, instructions and guiding, but you probably won't be allowed to stop to take pictures wherever you want. Explore the Provinces: Bolivia is a place to explore; it is mostly still untouched. The people are friendly in the countryside. There are hundreds of off the map, mostly out-of-the-guide places to go in Bolivia, and far more exciting than what the tour agencies and guide books offer. In the La Paz department for example you can easily catch transport to places like Pelechuco, the east side of Lake Titicaca, Achacachi, Isla del Sol, or Quime... not to mention scores of other villages and small towns. The free govt. tour agencies at the Plaza Estudiantes or Prado can help you find transport anywhere and tell you about it. Sustainable Bolivia is an organization that co-ordinates volunteers and grassroots organizations in Riberalta, and also offers Spanish, and indigenous languages classes. You can live in a house offered by Sustainable Bolivia, stay with a family, or live in a hostel while volunteering or taking classes. It can be difficult to change money other than euros and US dollars, even currency from neighbouring countries! You might find more flexible exchange offices at airports, but be prepared for service fees and poor exchange rates. USD bills smaller than $100 can also be hard to break without accepting a lesser exchange rate. CAUTION: As of May 2015, it is almost impossible to change US dollars that have the slightest tear or marking, even at the airport. Banks supposedly have to accept them, but locals advise that some banks take 20% discount for such bills. Make sure your dollar bills are crisp and new. USDs are NOT widely accepted in hotels, tourist shops, and for large purchases, anymore. The national currency is the boliviano (BOB). As of January 2010, the exchange rate is generally USD1 = BOB6.97 or €1 = BOB10. Banknotes come in denominations of BOB200, BOB100, BOB50, BOB20, and BOB10; coins are in BOB5, BOB2, and BOB1 and BOB0.50, BOB0.20, and you will find sometimes BOB0.10 (ten centavos or one-tenth of a boliviano). Bills larger than BOB50 can be hard to split, but a quick phone call or internet session at an Internet Café (see #Contact, below) will usually get you change. If you take a bank card with you, make sure your bank card can be used abroad (ask your bank if you are not sure). You don't need a credit card - debit cards work too. If you find your card doesn't work and you are running out of cash, think of your relatives wiring you some money via, eg, Western Union. Currency can be exchanged for US dollars and most South American currencies at Casa De Cambio agencies or street vendors. Expect to negotiate for a favourable exchange rate, as most vendors will try to make money off a tourist. Banco de Credito (BCP) is a good bank to take cash from. Banco Union should be avoided if possible as it charges a 5% surcharge (as of May 2012), although they do not make any mention of this. Banco Fie doesn't charge any extra fee on atm withdrawals but it lets you take only up to BOB2000 at time (March 2014), it has branches in all bigger cities. Coca has been part of Andean culture for centuries, and chewing is still very common (and perfectly legal) in Bolivia. You should be able to buy a big bag of dried leaves at the local market. Coca is a stimulant, and it also suppresses hunger. Chewing a wad of leaves for a few minutes should bring slight numbness to your lips and throat. Remember the slogan (printed on souvenir T-shirts): Coca no es Cocaina ("The coca leaf is not cocaine"). But cocaine most definitely is an illegal drug. Silpancho or Milanesa - beef pounded to a thin, plate-sized patty, served on a bed of rice and potatoes, with a fried egg on top (Similar to wiener schnitzel). Vegetarians will find decent to very good options in Gringo-places around the country. But also at market places, there are good vegeratian options on offer (usually potatoes, rice, fried egg and salad for about 7Bs.) In bigger cities, there are some (decent to good) fully vegetarian restaurants. Juice bars appear at most markets. Shakes (either with water or milk) are 2-3Bs. Locals can be seen drinking Vitaminico, an egg, beer, and sugar concoction or "Vitima" which includes coca leaves. Chicha de camba, chicha de maiz, chicha de mani - non-alcoholic chichas, made from corn and similar stuff. Very popular in the East of the country. The legal drinking/purchasing age is 18, however enforcement is lax. But in bars and clubs, expect harsh treatment if you're not the legal age, as the age limit is a lot more enforced in those places; bar and club owners can get fined. Bolivia Altiplano traditional alcoholic drink is chicha de colla, a whitish, sour brew made from fermented corn and drunk from a hemispherical bowl fashioned from a hollowed gourd (round-bottomed so you can't put it down). It's customary to spill a bit of chicha on the ground before and after drinking it as an offering to Pachamama, the Inca earth godess. There are a number of local beers, the largest being Paceña and its high-end brand Huari. El Inca is a very sweet low-alcohol dark beer (think Guiness with sugar and a lower alcohol content). Orange Cocktails are a popular drink too! Tarija is located at 1924 meters above sea level, and is known for its wine-making, vast vineyards, and award-winning wines. Hence you can visit and taste wine at its beautiful wineries, such as: Campos De Solana, Kohlberg, Casa Vieja, Valle De Concepción, and Casa Real, where the famous Singani is made. Offering a favorable exchange for Western tourists, lodging can be found at very reasonable prices throughout the country, from hostels to luxury hotels. One traveller to Bolivia reports that during a 4 week trip in 2012 they stayed mainly in hostels with the average rate per night c. USD6.50. The most basic accomodation facilities are Alojamientos (at BOB20/25 per night). While Bolivia is one of the poorest nations in all of South America, this country is rich in culture, natural beauty and wild animal diversity. One possibility to work in here is as a volunteer. Whether you want to express your love for animals or support the local community, you will get plenty of opportunities to do good in this country. To get an overview over all the volunteering possibilities in Bolivia, it's best to visit a comparison platform. Apply common sense and take precautions that apply elsewhere. All tourists should be careful when selecting a travel guide and never accept medication from unverifiable sources. At night try to use "radio taxis" as fake cabs are common and robbings and even rapes do occur. It is a good idea to register with the consulate of your country of residence upon entry into the country. And it is also helpful learn at least basic Spanish to keep yourself a little safe. Beware of a scam involving 'non-uniformed' policemen asking for your passport and permit; official policemen will always be satisfied with a copy of your passport and a copy of your Bolivian visa on your passport. In the event that the con-artists requesting this get aggressive do not hesitate to scream, yell, or do something to attract the attention of passers by. This will usually be enough to scare them away. The 'improvements' made to Yungas Road (the famous highway to death) have made the experience of traversing it go from emotionally harrowing to finger-biting, and Bolivian bus drivers seem all too confident when crossing it. Make sure to look for a reputable driver/bus line from other travelers if you do decide to make this trip. Be careful of cars when crossing the streets (particularly at roundabouts). Cars go quite "chaotic". There are usually no lane marking and minimal signage. It may be not safe to carry a big amount of cash with you. Instead, consider carrying just enough cash for a couple of next stops and a bank card to "fill up the tank" (be careful: smaller and not-so-touristy towns have no ATMs). Take some "international" (i.e. $US or €) currency for a safe start. As a safety measure you can take "secondary" bank card with you (leaving "primary" at home) pre-filling it with amount of money according to your travel estimate (and adding some more - for unexpected cases). If you are running out you may contact your relatives at home to log in into your e-bank account and move some more money to your "secondary" card. It may be wise to attach some sticky stripes of paper to your card with some fake PIN written in unclear manner (i.e. only segments of digits visible - other segments are to "guess") - if you lose your card and somebody enters a wrong PIN 3 times, your bank will probably block the card. Beware that many vendors will try to overcharge you. This is not specific to Bolivia, so just deal with it, of course. However, it's more perfidious here. Don't read on if it's not important to you. Coming from the North (Peru, etc.) Luckily price tags are more common in Bolivia. However, many times they quote inflated prices. So, they are only there to give tourists a false sense of control. Thus you not only need to check for price tags, but also if the quoted prices seem sensible. Of course, when there are no price tags it gets worse. Markups of 100% or more are not uncommoin. Why you should care? The locals will respect you more if you deal with money in a responsible way like they have to. Also, it's a good idea supporting honest vendors. Honorary Consulate of Poland, [email protected] Honorary Consul: Esther Caroly Salzmann Donig (speaks Polish, Spanish, English, French and German), [email protected] Calle Capitan Ravelo #267, tel. (00-591-2) 291 1754, (00-591-2) 291 1751. Some parts of Bolivia like La Paz (3650), Potosí (4010), Oruro (3950) and the Lake Titicaca region are high altitude, so adequate precautions against "sorojchi" altitude sickness should be taken. You can't usually drink tap water in Bolivia. There's plenty of bottled water being sold in the stores. One note though: if you're not a Coca-Cola company (very strong in Bolivia) fan, in some towns you may have trouble getting water from other manufacturer. Also, keep in mind the stark cultural and racial differences between the "cambas" of the Llanos in the east, and the "collas" of the Andes in the west who are Native American. They may not always tend to not be on good terms and have been even more fiercely divided in recent years since the election of Evo Morales, the country's first indigenous president. The two peoples tend to be very defensive about their side of Bolivia, so discussing your travel to the other cultural region of the country may be seen as insulting. In Santa Cruz, a city more industrialized, associating with indigenous culture is frowned upon, whereas in La Paz and elsewhere, it is quite the contrary. It is also good to keep in mind that the Bolivian culture is very warm and friendly. That being said, it is very rude not to say Buen Día or Buenos Días to passerbys in the streets. It also customary give up your seat on a city bus for someone older than you, or a woman. Which people will do for you if you look a little bit older. Bolivia has three cellphone companies, Entel, Tigo, and Viva. All three have outlets on practically every block in major cities. There are internet cafés practically everywhere, they typically cost about BOB3/hour, or about USD0.50/hour. If you have a smartphone (unlocked if you bring it from home) it can be quite affordable to buy a local SIM card and use the internet from the cellular network (pretty good quality 3G most of the time, don't expect any coverage in the most remote areas). You can always use your phone to make a Wi-Fi hotspot and share the connection to your computer (watch carefully how much you use if you don't want to bust your budget!). If you don't have a smartphone, you can still buy packages for minutes to call. Please note that SMS messages sent from Bolivia to other countries don't always get delivered. Buy your SIM card (called chip in Spanish) at an official outlet of the company. Entel seems to be the most popular one. SIM cards can be bought elsewhere but cost more. At the outlet they will also help you set up your phone. Be advised that you will need a "2G chip" for a normal phone and a "4G chip" for a smartphone if you want to use the internet. While traditional payphones still exist, you can also make local calls for BOB1 (USD0.15) from cellular phones at kiosks. If you are staying for a while, consider buying SIM cards for your cellphones. They are quite cheap and you get good network coverage in all main cities and towns. Bolivia uses GSM 1900 frequency, so check, if your cell phone supports this one (older European phones don't). You can buy a cell phone in Bolivia for as cheap as BOB200. For local landline - 010-citycode-number, i.e. for La Paz 010-2-number. For international landline or mobile - 0010-countrycode-number. Entel offers something similar to "packages" - these may be cost savers, ie if you mainly want to use cell phone to call international mobiles. A "package" entails you a fixed number of minutes of a smaller rate to call some area. To buy such a "package" you have to have required amount of cash in your phone card. You call a special number (some automatic service) and make a sequence of choices (by reading instructions on the screen and pressing numbers). After buying you have to use your minutes the same day. Call gets automatically disconnected when minutes expire. Using Skype from Internet cafes (there are a lot of these) may be an option, but microphones are screwed-up in most places thus making this option difficult. In Uyuni, for example, most internet cafés will not allow using Skype or, in case it is a Wi-Fi network, they will switch it off if they see you using Skype. They want you to use their phone service instead. You can send a postcard (BOB9 to Europe) to your loved ones from post offices. There is a number of adventure activities to do when in Bolivia. Paragliding can be done in both Cochabamba and La Paz. There is also the possibility of doing some mountain climbing, mountaineering and trekking. It is recommended when participating in these type of activities to use companies with a known safety record. 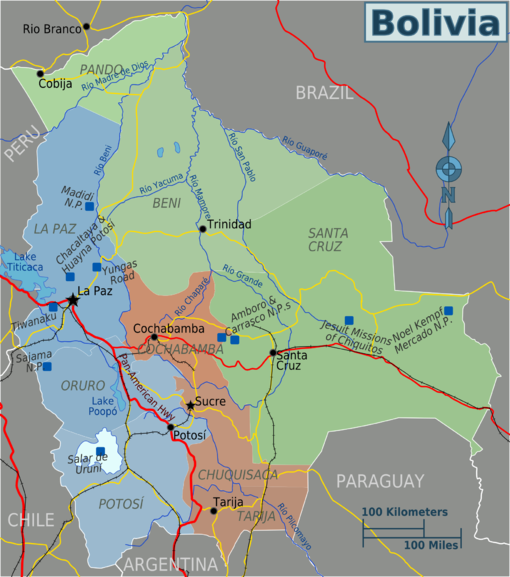 Andesxtremo has offices both in Cochabamba and La Paz. In Cochabamba you can find them at calle la paz # 138 entre ayacucho y junin Phone: 4523392, 70721520, 60365816. In La Paz Francisco Bedregal 2962, entre Victor Sanjinés y Pedro Guerra, Nuestra Señora de La Paz Phone:70193392. Other adventure activities that can be done while in Bolivia include white water rafting in and around el Chapare three hours from the city of Cochabamba. If you find yourself in Santa Cruz you can also go skydiving, there is only one company that does this and they can be found at El Trompillo airport in Santa Cruz. This page was last edited on 28 February 2019, at 08:34.